If we feel we cannot give your pet the necessary care, we will refer you to an appropriate specialist. 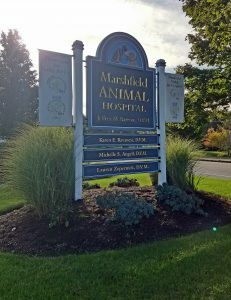 We offer discounts for humane organizations: Town of Marshfield Animal Shelter, Standish Humane Society, and South Shore Humane Society. We also offer a Senior Citizen discount. Call us today to schedule an appointment with one of our veterinarians.